Lace, ruffles, buttons and folds – these are a few of our favourite things! Darling details are back from the Victorian times, and we are loving the new global context they have exhibited on runways around the world. Ruffles and exaggerated open cuffs have come together with an Oriental outlook on simple chiffons and mulmuls to create a range of western and ethnic wear for the modern day lady. And why is this a win win for everyone? Because you can now keep wearing those sarees to work, and flaunt your inner tigress with a doll like flair whether it is a top or a skirt. Here is a quick look at a few pieces that will help you imbibe the beauty of those darling details for a fashionably fit outing! Aekta Dhingra Couture has created this piece that puts your serene side in touch with your fun, child like feminine side! I can imagine her rolling out of bed with a smile on her face, getting dressed in this number for a job she loves, even as she stops to smell the roses every once in a while! And also – no social media for her – her loved ones frequently get hand written notes! That is the image invoked by this outfit and its darling details. The ruffled odhni in a multi coloured palette, with a white affair that beautifully embraces the charm of the grown lady – such is the beauty of the ruffles added to the outfit. 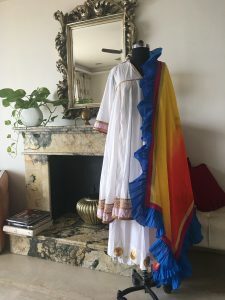 And as if that was not enough, you can also add some more charm by addressing that little girl who loved to play dress up with her mother’s dupattas and heels! 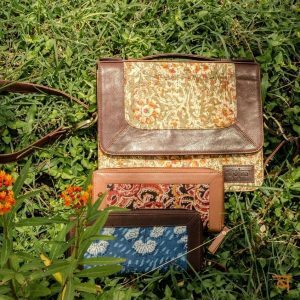 Botua by The White Muslin has a range of classic sling bags that have a kalamkari panel juxtaposed with the leather finishes. Created proudly by artisans who uphold the rich cultural weave of our country, this bag belongs to you, me, our mothers and our grandmothers too! Use it with the ruffles and lace for a look that will be no nonsense, classic and oh so refreshing! 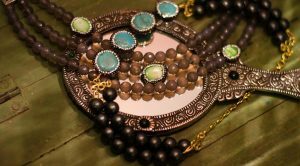 And of course, you can never go wrong with stones and those neutral pebbled hues that also add to your wellness and aura. Try some of these strands by StyleAura at The White Muslin to complement the bag and the outfit above. The flattened faces of the stones and the rough edges encrusted with shining dots will make the child in you come alive! And for the grand finale, the final finish, she decides to slay with a smile and a colour that is far removed from the glossy looks of magazines. Her message here is crystal clear – this is me! This goldilocks inspired look with the urban woman edge has been rendered by ace stylist Abhishek at Zulf!